FREE! Magazine » Under the Thai sun! Are you tired of waiting for spring to begin? The earliest months of the year in Finland are the coldest ones and the social life is much quieter than in the summer. That’s a given, but did you know that in Thailand the warm season is turning into a hot one in March? So, why don’t you have a break from the cold and head to sunny Thailand? Take a preview of the sun this year! Thailand is perfect for everyone: for backpackers, beach bums, families and hippies with flowers in their hair, as well as for burned-out business people, who just want to forget the real world filled with stock exchange prices and all that. 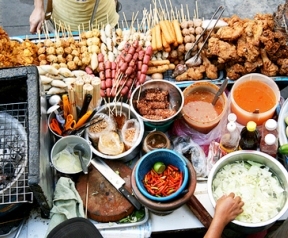 Spend a week, or months, exploring vivid Thai culture. You won’t get bored in Thailand: just chill out on the beach, check out the glorious temples, do some scuba diving or trekking. And whatever you decide to do, it won’t be too expensive! those interested in climbing, Railey beach is the place to be. Do you remember how it feels to walk barefoot on the beach? There are countless numbers of beaches to do that in Thailand: crowded ones and quiet ones. You just have to pick your favourite beach. Mine is Ko Phi Phi Leh, which is a deserted beach: no houses, just sand and palm trees! The island is also known from the movie called “The Beach”. full while you are in Thailand, because the restless travellers party pretty much every night! If diving is your thing or you have always wanted to try it, there are several great places to do that, like Koh Tao, the Similan islands, Phi Phi and Koh Chang. You can see a lot of colourful life under the surface: sharks, turtles and even massive manta rays! Imagine this: you are diving and suddenly it gets dark. You think that it is an unexpected eclipse of the sun. You look up and what you see is a big school of these friendly giants, manta rays, swimming on top of and all around you. It looks like they are flying. It is a sight that will take your breath away. shining temples all over the country are amazing and there are lot of them in Bangkok. A few worthy of mention: Grand Palace and Wat Phra Kaeo, where you can find the most revered Buddha image in the country. In addition to sightseeing, take time to explore those smaller side lanes. Who knows, you may even see a glimpse of the everyday life of the locals! There are lot of food markets around Bangkok where the food is very cheap and fresh, but if you want to see something different, go to the floating market. It is a nice day trip outside of Bangkok and you can buy sweet and fresh fruits and souvenirs from the boats. with my friend. Of course, the luxury room costs much more, as always. Eating out is cheap too and Thai food is amazingly good! cheeky, so negotiate about the price before you step into the vehicle. You can also rent a scooter, but please be careful: the traffic on that side of the globe is not as safe as here. Been there, done that: I had a motorcycle accident in Thailand. Luckily I survived! So, the safest solution is to take a bus or a train. The connections between the cities are well organized. But do remember that it is not Finland; vehicles may not be on time, buses may break down and weird things happen when you least expect them to, but after all, that is part of the adventure! After the holiday you will reminisce about those lazy days chatting with locals on the streets, the taste of fresh pineapple in your mouth and those sunsets you watched while lying in a hammock on the beach. And even a short trip to Thailand will make you happy for a long time! 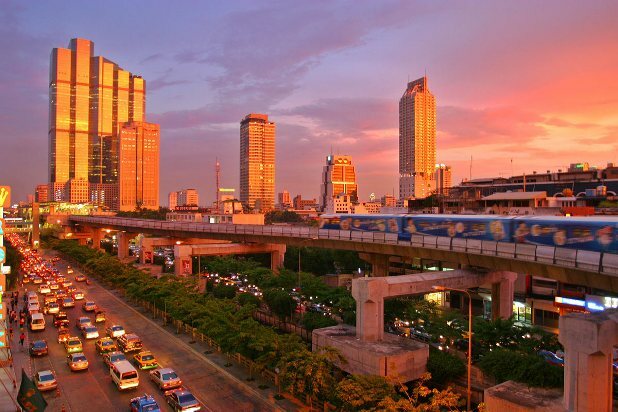 Thailand is such a lovely and lively place, that one article is just scratching the surface. Thus I say: Go there, discover it and you will fall for it!